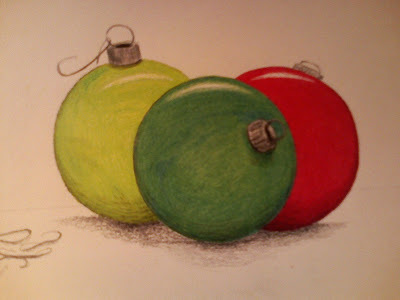 Artist Unplugged: MERRY CHRISTMAS EVERYONE!!! Wishing each of you and your families a very merry and blessed Christmas! Hoping all have a safe, happy day, with wonderful memories made. I have missed checking in with you this week, it has been a busy one but I have completed my art and baked. Thank you for all your wonderful comments you leave and especially your support! Love to you, your family and your cherished four-legged friends too! Haven't we all been busy?! Your ornaments painting looks great! Merry Holidays to you do - slow down a bit and enjoy the fun!!! Merry Christmas to you, too. Love your ball ornaments. Now you can take a breath and say "Ahhhh." Love your festive header. HOpe your day was wonderful and full of love. Merry Christmas. love the header. wishing you and yours all a very (belated) happy xmas and a healthy and creative 2010. maybe apollo can come and visit me in 2010?? Your baubles are stunning, AU! And the cake, and the photography, and the exhibition, and the beautiful Ragdoll and your family and the weather, and the pumpkins - And what is going on with your back now, and your bees-knees? All that work, and the new job - I am amazed that you manage to achieve so much, my sweet, with all the demands upon your time... That volleyball cake was so lovely, and you run yourself down about it - So many of us would be chuffed to bits at its beauty!